After disappearing for more than a decade, one critically endangered species has suddenly returned. Unseen since 2001, the short-nosed sea snake was presumed by many to have gone extinct, so scientists were understandly surprised recently when a pair of the creatures were spotted off the coast of Australia. "We were blown away," said marine biologist Blanche D'Anastasi, "these potentially extinct snakes were there in plain sight." Better yet, the snakes were courting, said D'Anastasi, "suggesting that they are members of a [larger] breeding population." On Monday, D'Anastasi and her colleagues at James Cook University announced the rediscovery of the short-nosed sea snake and a related species in the scientific journal Biological Conservation. 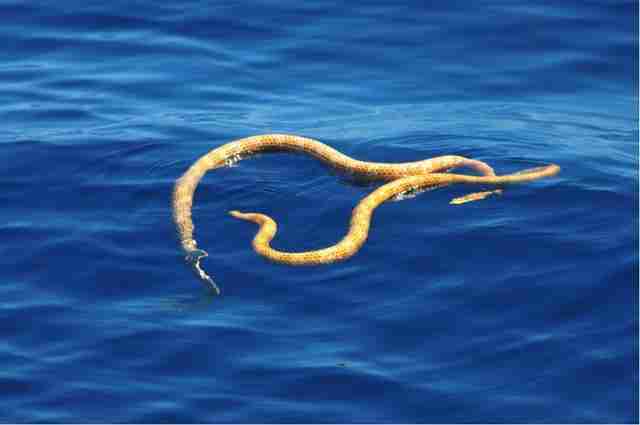 But while the sea snakes aren't extinct, they're still far from safe. For one, researchers still don't know what caused populations of the once-common sea snakes to drop by 90 percent since the 1990s. "This discovery is really exciting, we get another chance to protect these two endemic Western Australian sea snake species," said D'Anastasi. "But in order to succeed in protecting them, we will need to monitor populations as well as undertake research into understanding their biology and the threats they face." To learn more about protecting endangered species, visit the International Union for Conservation of Nature's website here.